In a continued effort to amaze and delight, the following customer programs launched on November 1st. See your actual order! Carter’s is the first in the industry to email a picture of your completed order with your delivery confirmation. 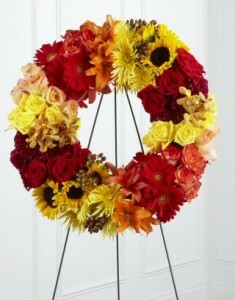 We have added over 120 new arrangements to our on-line sympathy catalog. We have added rental linens to our website. With our “Fabric Selector” you can choose your table linens, chaircovers and additional accessories, click a button and wahla… a virtual image will appear on your screen. Click here to check it out! There is always something unexpected happening at Carter’s! 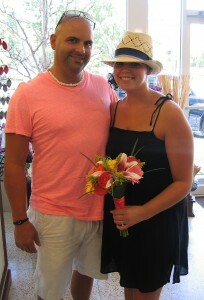 Today a bride and groom visited our shop in search of a bridal bouquet. They are getting married tonight on St. Pete Beach. I took them in the cooler and the bride picked out a handful of flowers that she wanted transformed into a bridal bouquet. 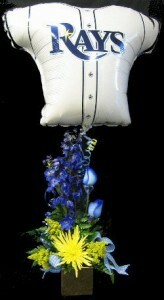 While Rob was designing the bouquet the happy couple went down the street for an award winning Chattaburger. EXCEPT…. HAUNTED HALLOWEEN October 25 and 26. Register now! 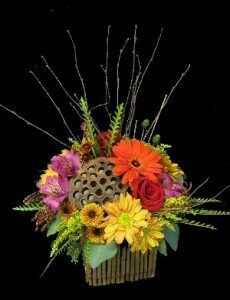 Call Cassie at 727.327.5568, or email cassie@cartersflorist.com. 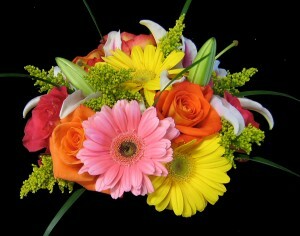 A woodland mix of daisies, gerbera daisy, roses, alstromeria, eucalyptus, assorted fall foliages and birch branches in a square shaped twig container. Sporting Ray’s blue plaid and sunburst yellow. Delight your Ray’s fan with our good luck charm! 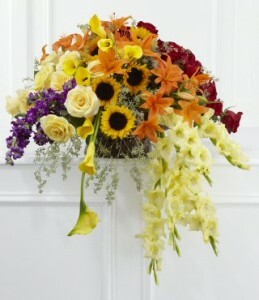 We now have 355 Carter’s custom created bridal bouquets on-line for your viewing pleasure. 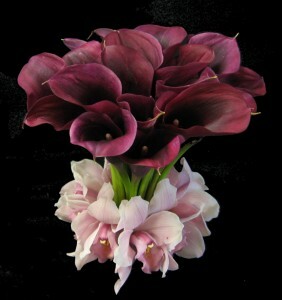 This gallery contains creations for brides we have expertly provided their wedding and floral decor. Take a peek You’ll be amazed! Check out our redesigned home page which makes on-line ordering much quicker and simplier AND access from your smartphone and view our mobile version! 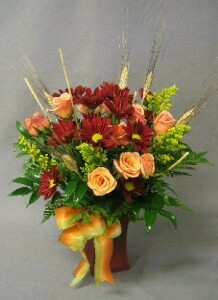 A harmonious mix of long lasting daisy pom pons, sprayroses, solidago, and wheat placed in a frosted autumn colored glass vase. $34.95 click on image to order now!